Back to the kitchen I went, hoping some modifications would help. Nope. The second batch spread too thin and crumbled horribly, leaving us with a Tupperware now full of biscuit-y cookies and crumbly cookies (Steven still wasn’t complaining). After that, I gave up — I’ll return to the concept soon, but I couldn’t bear a third failure in one day. That’s the rub, when it comes to recipe development: you’ve gotta be okay with failure. As a semi-reformed perfectionist, I still get frustrated when things don’t go my way. I’m learning to be okay with it, and to learn from it, but it still grates on me. So a few nights ago, when another idea surfaced in my MoFo-inspired mind, I headed to the kitchen with just a little trepidation. 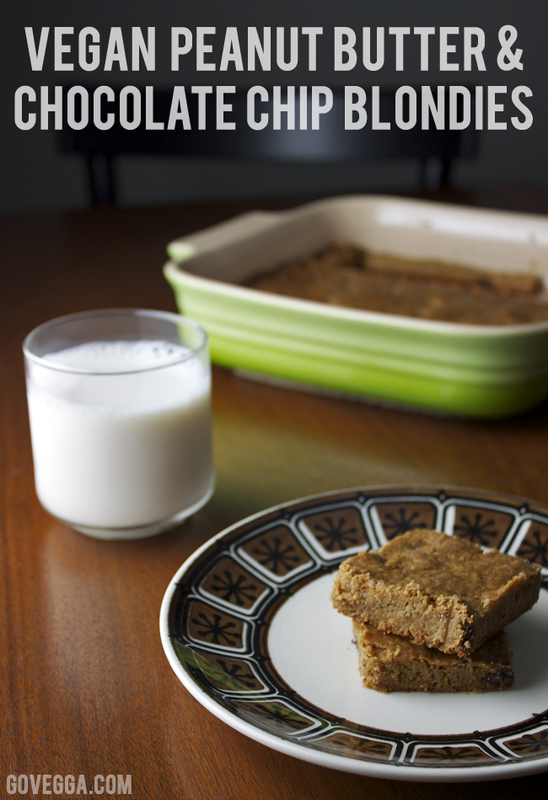 I knew what I wanted: rich, chewy vegan peanut butter blondie bars that would almost melt in your mouth, studded with chocolate chips for a slightly bitter counterpoint to the sweetness. I melted, mixed, tasted, and finally put them in the oven, hoping my baking mojo had returned and that the curious alchemy of cookie-creation was in my favor that night. It was — though I didn’t think so at first. As I tried the blondies, my initial reaction was disappointment. They weren’t sweet enough! I had failed! I kept chewing, though, and soon realized that they did indeed have a perfectly pleasant sweetness; a few tablespoons of maple syrup add complexity and mean that the sweetness grows slowly on your tongue. 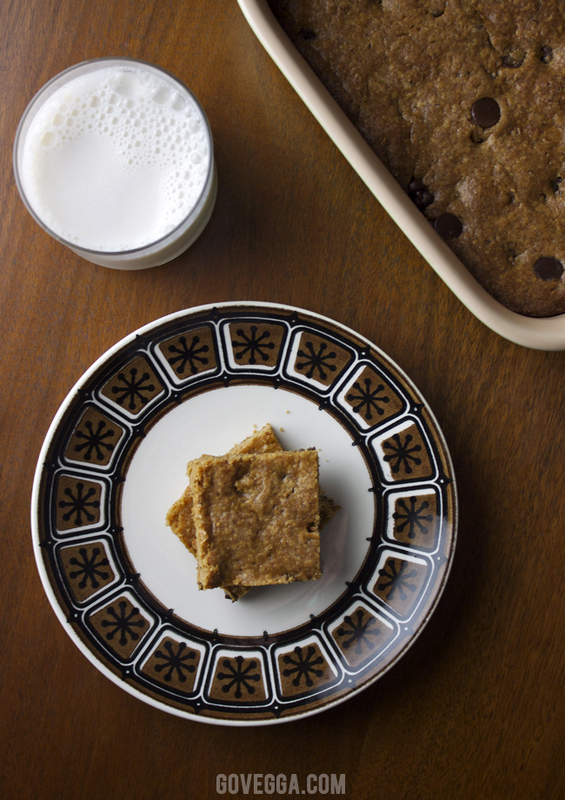 And you wouldn’t want them much sweeter — these are rich, buttery blondies; too much sugar would render them cloying and unpleasant to eat. Preheat the oven to 350˚F and oil a 9×9″ baking dish. In a large mixing bowl, stir together the melted Earth Balance, peanut butter, and vanilla extract until well combined. Add the sugars and maple syrup and incorporate, then stir in the salt, baking powder, ground flax, and flours. (You might want to add the flour a little at a time for easier mixing.) Fold in the chocolate chips. The mixture should be similar to cookie dough. Add the dough to the prepared baking dish and use a spatula to spread evenly. Bake for 23-25 minutes, just until a skewer or knife comes out clean. Do not overbake. Cool for at least 10 minutes before slicing and enjoying. I’m sure you could omit the white whole wheat flour in favor of more all-purpose flour — though you might need to add a few tablespoonfuls more. Feel free to substitute mini chocolate chips or even white chocolate chips. These would probably cook up well in an 8×8″ pan — just cook for a couple minutes longer. Looking for a slightly healthier dessert option that’ll still leave you feeling like you’re treating yourself? 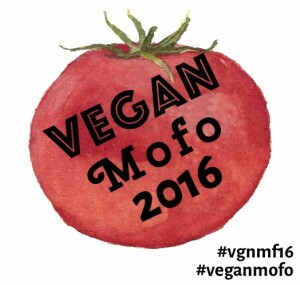 Why not try my fudgy black bean brownies, a treat from MoFo 2014? Wow, they look good! Secretly, I kind of like it when baking goes wrong and the final product isn’t quite good enough to share – more for me, and more excuses to keep baking! I like that silver lining!